The Vancouver Asian Heritage Month Society (VAHMS) would not be a success without our wonderful team of enthusiastic volunteers. Join us in fostering diversity and harmony in our community. Be part of the fun and rewarding experience! The Vancouver Asian Heritage Month Society is a Vancouver based, not-for-profit, multicultural, arts and culture organization. 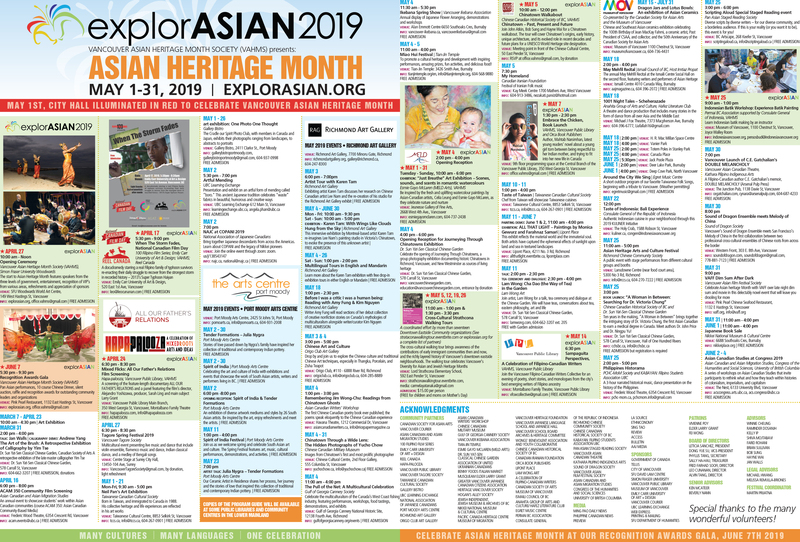 Founded in 1996, the Vancouver Asian Heritage Month Society is dedicated to promoting appreciation for the contributions of Asian Canadians in Canadian society. The Society organizes explorASIAN, an annual festival celebrating national Asian Heritage Month in the month of May. The festival includes art and cultural programs, activities and events produced in collaboration with various partners from the diverse communities in Metro Vancouver. We are looking for a new board member for the position of Secretary.